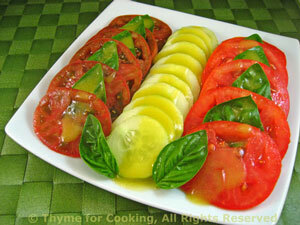 Tomato Cucumber Salad, Thyme for Cooking easy summer side dish. Pretty and flavorful salad, with the best of the season! Peel and slice cucumber, about 1/8" (1/4cm) thick. Combine mustard and vinegar in a small bowl. Arrange tomatoes, cucumber and basil nicely on large plate. Drizzle with vinaigrette and serve.